The German team finished the three rooms. One week ago their latest guests had arrived: Bernhard from the German Aerospace center and Birgit, who is an architect specialized in documenting castles and antique sites with the most advanced technology available in these days (which doesn’t come from archaeology, but space technology…). Bernhard’s profession is dedicated to 3-D-picturing and measuring techniques for the Mars surface, but he wanted to find (almost) equally hard conditions for the equipment on earth. Thus, Ostia is the perfect place to be! Birgit and Bernhard were not disappointed on their first day experiencing strong winds, rain, extreme humidity and extreme differences between day and night temperatures. 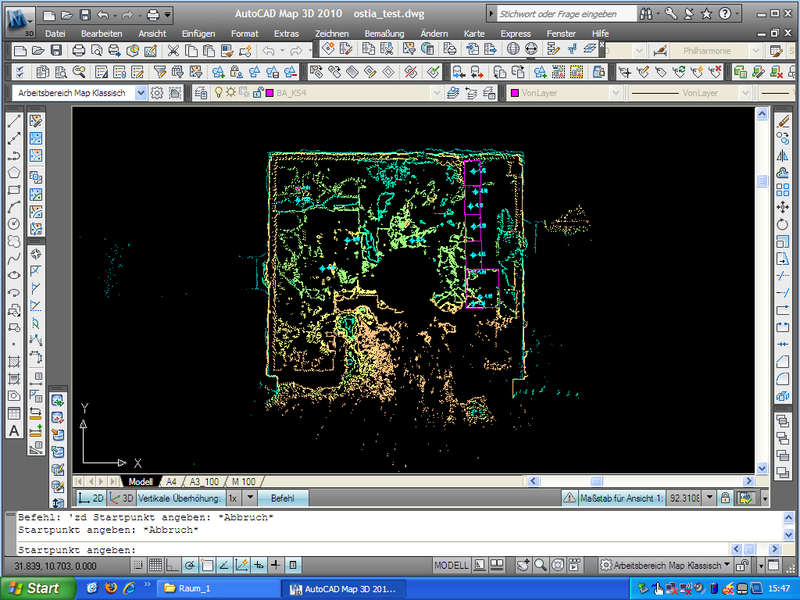 After laser-scanning they chose to do 3-D-‘orthofotography’ with a special camera, which measures all details of a surface with a tolerance less than a millimeter. So we said goodbye to the times when all finds had to be drawn and measured by use of a total station. 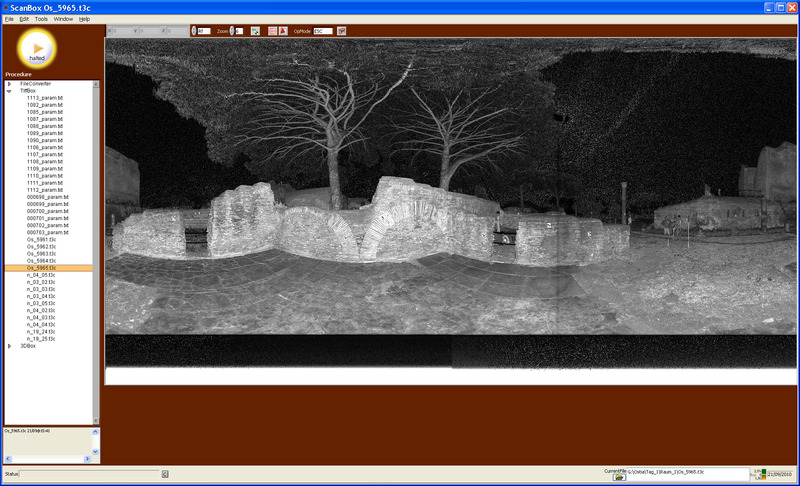 The lasers’ results were striking: the colours (picture below) show different levels of elevation which allows us for example to distinguish modern reconstruction and destruction from the original slabs still remaining in situ (pictured above shows laser-scanner’s original 360 degree view, pictured below the laser-plan of the middle room mentioned above). « The praefectus’ offices on the main Forum?